As a small business owner, you've invested time and money to follow your dreams and launch your company. Now you must deal with tight budgets and urgent hiring needs. One of the best investments you can make is to find and hire reliable people who will help grow your business. Backgrounds Online is your partner in this process. Our background reports help you identify qualified candidates who could become long-term employees. Use the reports to make educated hiring decisions so you can focus on your ongoing growth and success. People who work at small businesses may interact with the public, handle money, drive while on the clock and tackle a myriad of duties. It is essential to hire people who can be trusted with these responsibilities. Screening potential employees helps you find those people. Backgrounds Online offers affordable screening packages and Custom Background Checks that suit your business needs and budget. They are an ideal way to learn about individuals who might represent the company you worked so hard to establish. One of the most discouraging issues small businesses face is employee theft. In most cases, the theft involves inexpensive items such as office supplies, but the losses can become substantial over time. 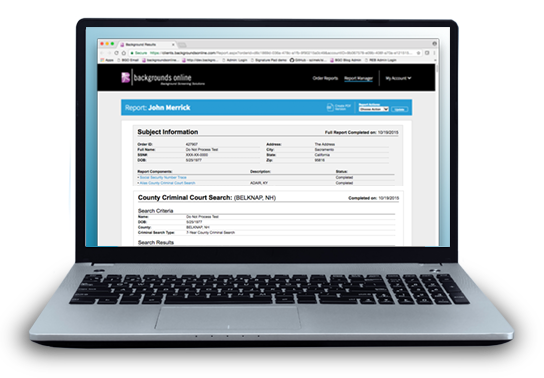 While no background check predicts a person's future actions, they do tell you if an applicant has a reportable criminal record. They also show you a person's employment history, which provides insight into their reliability, and references, which offer honest feedback from people who know and have worked with your candidates. You may be tempted to run your own searches to learn more about your applicants. However, it is illegal to make hiring decisions based on information you find online. At Backgrounds Online, we work hard to keep up with current and new screening regulations that impact small businesses. We build FCRA compliant background checks that only contain facts you can legally use during your hiring process. Rely on us whenever you need to screen potential employees. We'll give you the details you need to make ideal hiring decisions that follow all state and federal regulations. Do I need to screen seasonal employees? How can annual screenings help my business? A: One of the reasons to run a background check before you hire someone is to make sure they don't have anything on their record, such as a serious criminal offense, that could negatively impact your business. Annual reports show you if existing employees incur a new traffic violation, bankruptcy or criminal conviction that might impact their eligibility to retain employment at your company. They help you protect your business, staff and customers on an ongoing basis. What do you recommend for employees who will handle cash? A: If you're hiring employees who will handle financial transactions, we recommend a thorough criminal background check. Depending on the type of position, we may also suggest a Employment Credit Report that shows you information about the applicant's past creditors, bankruptcies and financial civil judgments. Our staff is trained and knowledgeable about the best background check packages for every industry. We are happy to talk to you and ensure you have the best screening options. For more information or advice, please contact us. Are there different screening rules for part time and full time employees? A: No. The laws that govern the hiring and background screening process are the same for full and part time employees. Small businesses are an essential part of our nation's economy. We'll help your business grow by empowering you to find qualified applicants for your industry.